Cotton undersleeves available in an assortment of colors and can be decorated with lace or ribbon trim. Call for availability. Cotton open crotch or closed crotch, draw string or made to order waist size, selection of trim colors This underpetticoat has a drawstring waist and lace bottom. It is made of 100% cotton and one size fits all. The chemise has an adjustable neckline for a day dress or ballgown. Ribbon can be added as a neck adjustment upon your request and with no extra charge. It is made of 100% cotton. Sizes available are Small, Medium, Large, X-Large, Queen, and X-Queen. 4 bone cotton draw string ruffled hoop. For smaller waist lines. 4 bone draw string cotton ruffled hoop extra-large. For waist sizes above 36"
6 bone tiered cotton draw string hoop. For smaller waist sizes. 6 bone tiered ruffled draw string cotton hoop Extra Large. For waist sizes over 36" Made of hemp muslin with rows of roping to hold your work skirt out. 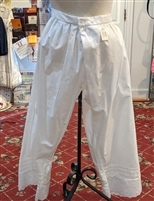 Starting in the 1820s and through to the 1860s, this was a critical undergarment that was required in order to get the "proper" bell-shape to you skirt. It came into fashion right after the Regency era when the waist line was slowly dropping and before the American Civil War when hoop skirts were commonly used. The corset is one piece busk with boning and made of 100% cotton. It is available in sizes 8 thru 24.